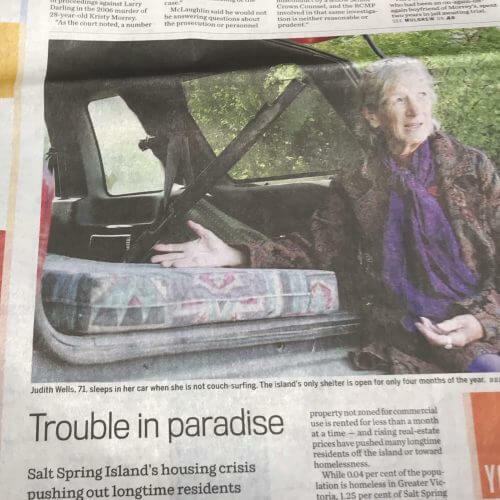 The severity of Salt Spring’s housing crisis is well known by the many hundreds who are directly affected, and by a few hundred more like me who know people who are. But as of yesterday, tens of thousands across the province won’t just think about forests, beaches, and the Saturday market when they think about Salt Spring, but also about our severe housing crisis, and how a caring community like ours could have allowed it to get this bad. Vancouver Sun reporter Behdad Mahichi was on Salt Spring two weeks ago, and wandered across the table of our new group advocating for solutions to the housing problem. After chatting with some volunteers and reading some stories people have sent us, he pitched an article to his editor and was back on Salt Spring last week. 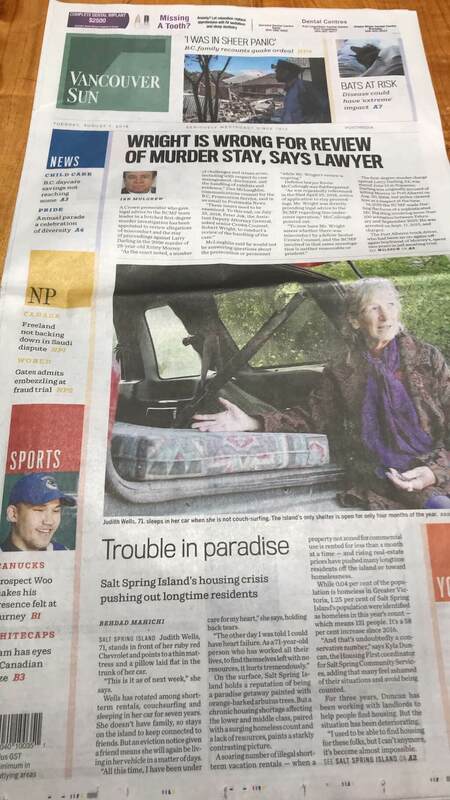 The article, “Salt Spring Island’s housing crisis pushing out longtime residents” graced the front page of the Tuesday, August 7 edition. It opened with the story of Judith Wells, a 71-year old who now lives out of her car. Sadly, we’ve heard of at least 6 women in that age group in the same circumstances. “Judith Wells, 71, stands in front of her ruby red Chevrolet and points to a thin mattress and a pillow laid flat in the trunk of her car. “This is it as of next week,” she says. Wells has rotated among short-term rentals, couchsurfing and sleeping in her car for seven years. In the absence of family she stays on the island to keep connected to friends. But an eviction notice given to a friend means she will again be living in her vehicle in a matter of days. Readers will learn that Salt Spring’s homelessness rate, at 1.25%, is significantly higher than Victoria’s, at only 0.04%, and that this rate has increased by almost 60% in only the last 2 years. That figure however comes nowhere near capturing the full extent of the problem, as the crisis is affecting even more middle and working class people, who hardly fit into our stereotypes. The story was well researched – the roots of the problem aren’t simple and the reporter did a good job outlining many of the interconnected reasons for what we have now: land use and density zoning controlled by an agency whose main purpose is to protect the ecosystem (and not support communities living within it), water restrictions, rising housing prices, and short-term vacation rentals. All managed by a governance system with responsibilities split between multiple agencies, one of which, the CRD, has very little interest in or attention to pay to our tiny island. Reflecting the mindset that perhaps keeps bold solutions from gaining traction, Islands Trust trustee George Grams was quoted as saying he supports the idea of putting a cap on how many people can live on the island. What Grams and others of comfortable means don’t get is that far from growth being the problem, the housing crisis is about to shrink the island – further draining it of young people, those who provide health care and education services, farm-workers, employees of local businesses, many seniors who don’t own homes, and long-term residents alike. We are even hearing stories of owners of local businesses looking seriously at leaving due to lack of housing for themselves. “Sometimes people’s response is ‘just leave.’ We have our lives here, this is our home. My daughter is working here, she’s got a boyfriend here, my son is in school and has his best friends here. I don’t think the answer should be to just push us off the island.” – Jennifer Campbell, working mother of two now living in a campground. Be sure to read the article at the Vancouver Sun website and if you agree that the crisis is unacceptable in such a wealthy, creative community like Salt Spring, we invite you to get involved and help us work for solutions.